It goes without saying that we had an unforgettable vacation on our Crystal Cruise from Lisbon to Barcelona via Morocco. Everyone enjoys a Crystal Cruise for the ultimate in luxury cruising. We boarded the Crystal Serenity in Lisbon, a city with a rich combination of beauty and history, then checked into our luxurious Veranda Stateroom after enjoying a welcome glass of Cava sparkling wine. And we were on our way! Our Bon Voyage Dinner was a sumptuous feast as was the Captain’s Gala Dinner on the second evening. A Crystal Cruise is all-inclusive so alcohol, gratuities, enrichment classes, and premium restaurants are all at no additional charge. Crystal ships are considered mid-size, carrying around 1000 passengers–large enough to have top-notch entertainment and activities, yet small enough to have the attentive service & exclusive amenities that have won them Condé Nast and Travel & Leisure’s top awards in their category for nearly 20 years. Our first stop was Funchal, Portugal, a picturesque port city with a gondola-style cable car that conveys you up to a high vista point for pictures of the city and the ocean spread out below. Next stop was Santa Cruz de Tenerife, the capital of the Canary Islands, another fine port with great photo ops. Our amazing meal that night onboard Crystal was at Silk Road (featuring celebrity chef Nobu Matsuhisa’s cuisine) at no extra charge. 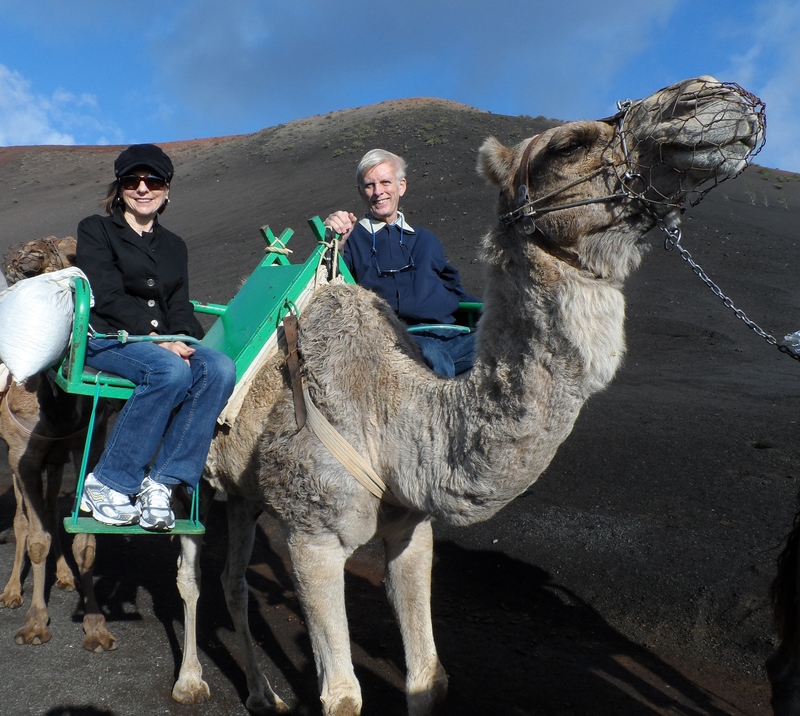 Then we were off to Arrecife, famed for its rock reef and active volcano, where we rode a camel for the first time. The next port was Agadir (my first time in Morocco) with its beachfront promenade and lively Kasbah, followed by Cadiz, a Spanish port city with a 3000+ year history. Valencia, the home of paella, found us indulging in this piquant seafood specialty, of course! And we ended our adventure in Barcelona, probably my favorite city, the history-rich home of Gaudi and his renowned La Sagrada Familia cathedral. In between exotic ports, there was never a lack of things to do on Sea Days. We enjoyed Computer University@Sea classes including PhotoShop and Power Point. We relaxed by the pool with a beverage and a book, played Trivia, listened to lectures, watched movies, had lunch at the Trident Grill and visited the Ice Cream Bar. The entertainment each night varied between comedians, dancers and shows including some very talented local musicians. Along the way I snapped a picture of a rainbow ending right on our own Crystal Serenity. Not a pot of gold, but close. When you cruise on Crystal, you will be pampered—and then eagerly look forward to your next cruise! This entry was posted in Cruise, Iberia, Portugal, Spain, Travel and tagged BArcelona, CanaryIslands, cruise, CrystalCruises, Iberia, Lisbon, luxury, Morocco, Portugal, Spain, travel, vacation. Bookmark the permalink. Thank you for enjoying our blog! More to come soon!